DM Technology – First there was AM and then there was FM. Now there's DM. Digital Modulation is an advanced technology superior to AM or FM based systems, that give the greatest protection from false correction. 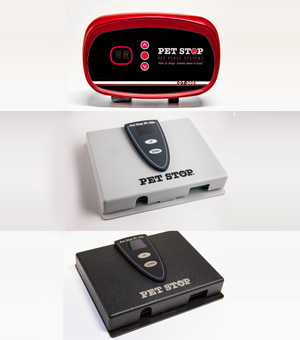 Like our receivers, Pet Stop transmitters are on the cutting edge of technology. We've made customization and ease of use our priority. We want to give you the simplest ways to make sure your electronic fence system is up and running. Digital Display – All Pet Stop transmitters feature an easy-to-read digital display that, when lit, lets you know your unit is working. More importantly, you'll know exactly where your field is set. No guessing or having to call a service rep, the digital display lets you know 24/7. Compatibility – Our Outdoor Transmitters are fully compatible with our Indoor Transmitter and most competitor systems, including Invisible Fence  ®. Power Loss Memory (PLM) Protection – In case of power failure, Pet Stop's Power Loss Memory feature remembers your settings. A three-button design that carries a full lifetime warranty. Our two-button design in an more economical package that carries a two-year limited lifetime warranty. Perimeter Technologies is not associated with Invisible Fence  , Dog Guard, Dog Watch or PetSafe.